Like many of you I woke up this morning to an email inbox full of leftover Black Friday ads, a whole bunch of Cyber Monday ads, and the Xth day in a row of #GivingTuesday announcements. Among those was the first clearly-designed-to-misinform #GivingTuesday astroturf email that I've received. It came from the Center for Consumer Freedom (CCF) - a nonprofit front group run by a lobbyist for a variety of industries including restaurants, alcohol, and tobacco. The umbrella group for CCF - the Center for Organizational Research and Education (CORE) - is also home to HumaneWatch. 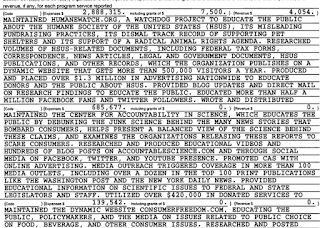 According to the 2016 990 tax filing for CORE, HumaneWatch exists to "educate the public about the Humane Society of the United States (HSUS), its misleading fundraising practices, its dismal track record of supporting pet shelters and its support of a radical animal rights agenda." "The Center for Consumer Freedom is supported by restaurants, food companies and thousands of individual consumers. From farm to fork, from urban to rural, our friends and supporters include businesses, their employees, and their customers. The Center is a nonprofit 501(c)(3) organization. We file regular statements with the Internal Revenue Service, which are open to public inspection. Many of the companies and individuals who support the Center financially have indicated that they want anonymity as contributors. They are reasonably apprehensive about privacy and safety in light of the violence and other forms of aggression some activists have adopted as a “game plan” to impose their views, so we respect their wishes." If you check the CCF's 990 form (Search under CORE) you'll find that on revenue of $4.5 million (sources undisclosed), the largest expense was $1.5 million paid to Berman and Co, for management fees. Next largest expense is $1.4 million spent on advertising and promotion. I've written before about misinformation, the current ecosystem of distrust, and civil society. And here it is. Be careful out there.